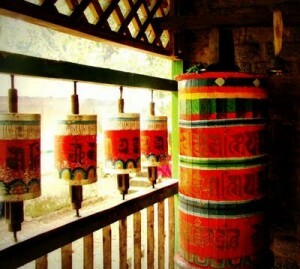 Just recently, I came back from a trip to Sikkim. 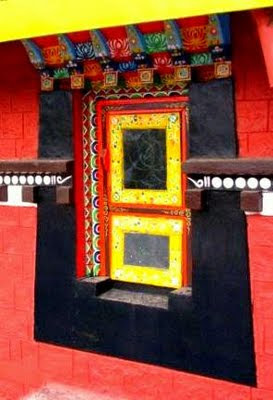 Now you might think that the article is titled Tibetan Art and I am talking about a visit to Sikkim. 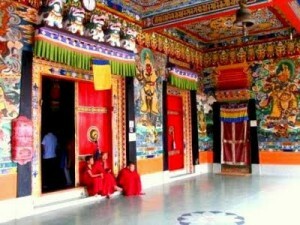 The fact is, Sikkim is heavily influenced by Tibet and its culture. Most of the people in Sikkim have direct origins from Tibet and have migrated to India in the last 100 years and more. The place is so surreal, untouched, spiritual and colourful that I couldn’t help but write more about the art and architecture. It deeply inspired me to implement it in my work but before that I wish to share it with all of you. 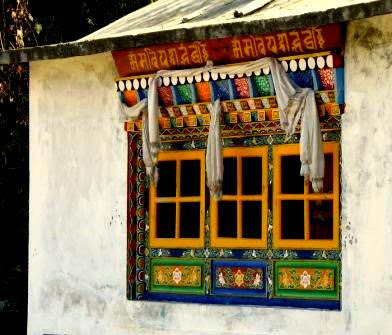 Tibetan architecture is one of the most simple, colourful and splendid form of art. Its simplicity brings out the temperament and character of the lives and people of the place. 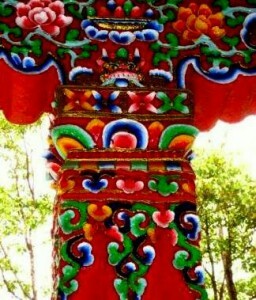 Tibetan Buddhist architecture, in the cultural regions of the Tibetan people, has been highly influenced by China and India. For example, the Buddhist prayer wheel, along with two dragons, can be seen on nearly every temple in Sikkim. Many of the houses and monasteries are typically built on elevated, sunny sites facing the south. Rocks, wood, cement and earth are the primary building materials. Flat roofs are built to conserve heat and multiple windows are constructed to let in the sunlight. Due to frequent earthquakes, walls are usually sloped inward at 10 degrees . Furniture from Tibet has always been quite rare. Except for the wealthy, Tibetans used very little furniture in their homes, and the population of Tibet has always been so small that not much was ever made. 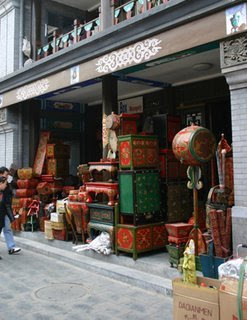 Most of it was probably always found in the monasteries, and of course most of these monasteries were destroyed by the Chinese during the “Cultural Revolution” along with huge amounts of furniture. 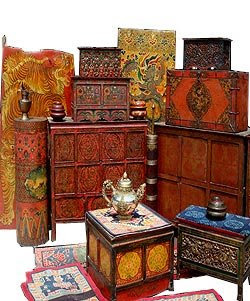 Made primarily from pine and other Himalayan soft woods, it is noted more for its sometimes lavishly painted surface and/or carved decoration than for its joinery. 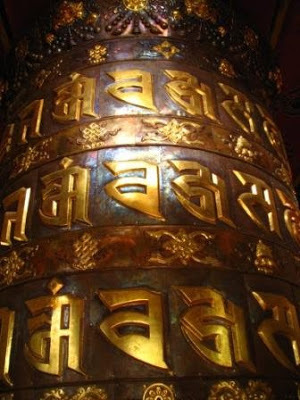 The eight Buddhist auspicious symbols consist of – a parasol, pair of golden fish, the great treasure vase, a lotus, the right turning conch, the endless knot, the banner of victory and the wheel of dharma. These originated from a group of early Indian symbols of royalty which were presented at special ceremonies such as the coronation of a king. 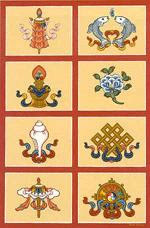 The symbols differed between different groups, for example the Jains and Newar Buddhists. In Buddhism these symbols of good fortune represent the offerings that were made by the gods to Shakyamuni Buddha immediately after he attained enlightenment. Brahma appeared offering the thousand spoked golden wheel as a request to Shakyamuni to turn the teaching wheel of dharma. Indra appeared presenting the right spiraling conch shell as a symbol of the proclamation of the dharma and Sthavara presented the golden vase full of the nectar of immortality. The Sri Chakra or Shri Yantra is formed by nine interlocking triangles that surround and radiate out from the bindu point, the junction point between the physical universe and its unmanifest source. It represents Sri Lakshmi, the goddess of abundance on all levels, in abstract geometric form. It also represents Tripura Sundari, “the beauty of the three worlds.” Four of the triangles points upwards, representing Shiva or the Masculine. Five of these triangles point downwards, representing Shakti or the Feminine. 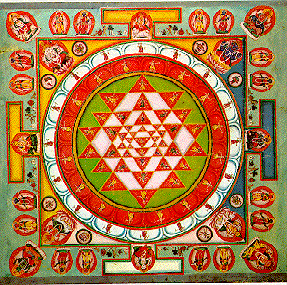 Thus the Sri Yantra also represents the union of Masculine and Feminine Divine. Together the nine triangles are interlaced in such a way as to form 43 smaller triangles in a web symbolic of the entire cosmos or a womb symbolic of creation. This is surrounded by a lotus of eight petals, a lotus of sixteen petals, and an earth square resembling a temple with four doors.